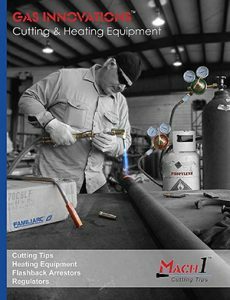 Mach 1 cutting tips are designed to enhance fuel gases for hand or machine cutting. With the Mach 1 cutting tip, higher steel cutting speeds are obtained, there is a narrow kerf width, and it will last 3 to 5 times longer than other tips in the industry today. The unique stainless insert for the cutting oxygen provides a jet stream to cut 2″ to 6″ off the plate. Watch the video here. The RIPPER Tip is the fastest cutting scrap tip, and it is also the best bevel cutting tip. Its unique design with coarse splines, a heavy solid copper shell, and stainless insert allows this tip to cut through rust, paint, and titanium. It’s extremely fast and efficient, reducing cutting and bevel cutting times in half. See more applications and videos here. You can expect to reduce your heating times in half when using MACH 1 HD propylene tips. Gas Innovations has the economical solution for the rising cost of Acetylene. 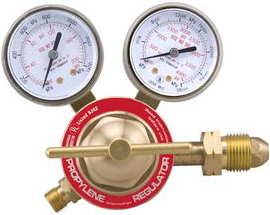 When changing from Acetylene to Propylene typically you can use your existing regulators, tips, and equipment; however, it is recommended to use T-Grade Hose and Propylene tips and change regulators when it comes time for replacement. Gas Innovations has created the ability to purchase individual components shown below and in our equipment catalog. The combination of separate mixers, goosenecks and tips reduces your inventory and makes it more cost-efficient. This equipment replaces your old equipment when it comes time to upgrade to Propylene equipment. New 8 lbs. 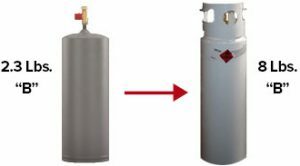 Propylene “B” tank replacement allows you to easily solder and braze without oxygen. See this video. You use all of the product – no residual gas leftover, no filler, and no acetone. 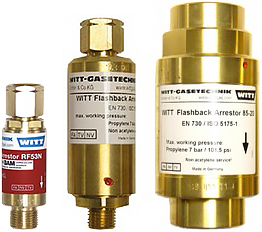 Gas Innovations Flashback Arrestors provide protection against dangerous reverse gas flow and flashbacks in accordance with EN 730 / ISO 5175-1. They are 1003 tested, use Viton seals and have higher flow rates than other flashback arrestors. A built-in temperature-sensitive cut-off valve extinguishes sustained flashbacks long before the internal temperature of the arrestor reaches a dangerous level. A spring-loaded non-return valve prevents slow or sudden reverse gas flow, forming explosive mixtures in the gas supply. 85-30 is ideal for flame spray HVOF applications and the 85-20 is recommended for bulk tank installations.